ALL Day, Caffeine-and-Sugar-Free Energy IS Possible! Don’t drag through life in an unfocused fog anymore! Listen to this special message from Michael Tyrrell, who has created an amazing collection of energizing Wholetones Frequency Music. Hundreds of thousands of people in 174 countries have taken their life to a new level of energy, activity and accomplishment with this amazing, specially-crafted music that can’t help but amp you up all day, every day! For over 20 years I have used scientifically-crafted MUSIC to help hundreds of THOUSANDS of people calm their body, soothe their spirit and quiet their mind! And now, I have something new to get you safely, and naturally pumped UP and ENERGIZED for your daily activities! Let’s face it, most adults over age 18 struggle with low energy. And most of them fix this problem with too much caffeine, sugar and energy drinks, or by oversleeping, and trying to catch up. But these habits are HORRIBLE for your health! That’s why I created the most breathtaking, innovative and unique “frequency-based” solution for low energy! I call it...Wholetones® ACTIV! Wholetones ACTIV is what I call “Sonic Caffeine.” And it will give you unlimited fuel for the gym, for your entire day, for your favorite activities, even for your love life, and be a jump start for your daily life! This isn't quiet, peaceful, motivational music. It's aggressive! It's fun and in your face! It will get you moving! Just like when your favorite song comes on the radio... It instantly peps you up and gets you excited! Yes, the right music can make you feel alive, invincible and like you can to do anything! We ALL need extra energy and a boost of excitement! Maybe you drag in the morning, or get run down in the after- noon, or you get drowsy while driving, or feel like going to bed by 7:00 pm. Maybe you find yourself nodding off in a business meeting, or you get wiped out after a long day of chasing after kids, but still have things to get done. This is why I created Wholetones ACTIV! For everyone who needs more energy, stamina and vitality in their life, but who does not want to keep chugging a steady stream of dangerous caffeine! Wholetones ACTIV is natural, effective pep and energy ... with NO side effects! Forget those dangerous energy drinks with their health-destroying side affects. And don't even THINK about over the counter “pep pills” that make your heart race! Wholetones ACTIV can give you better, healthier, natural, all day energy levels to get you through the day! As you lay in bed in the morning to get amped up for your day! On your morning drive to put you in a positive, upbeat mood! While you work out, for the most energetic music you’ll find! During your lunch to power you through a focused afternoon! When you need an afternoon pick me up! To help you stay sharp during a late night! To help you find the motivation for an activity or work project! Every ACTIV song has been optimally created with specific frequencies AND Beats Per Minute (BPM) rhythm to give you optimum heart rates and maximum energy! Yes, there is a science behind music and how it affects your brain! And I have created motivational musical compositions that activate your brain and get it moving. And when your brain is activated, your body follows. ACTIV contains 8 electrifying songs that will give you maximum daily energy! The special frequencies you see are what make Wholetones ACTIV special! Without these carefully-measured frequencies, it's just mere music. Frequency-based music resonates with your soul. It’s music you can feel inside. It’s music that wakes you up and makes you move! But you have to experience it yourself to see and feel what it can do to you. Feel the energy - Check out the music samples here! Tap here to play 174 Hz. Order now and save! Use the coupon code to save on either the CDs or a digital download. Think of the money you’ll save when you break your all-day-caffeine habit. And you’ll feel better with natural, all day energy — without any hard crashes when your quick energy burst suddenly runs out. ACTIV is energy on the go! It’s feel-good energy that never runs out or that you have to keep buying. Once you have this special “frequency-formulated” music in your hands, unlimited energy and buzz is yours, all day, every day! Ditch the coffee! Forget the drowsy days and mental fog that follow you around all day. This is the only 100% safe, non-chemical or sugar-filled stimulant you’ll find that is proven to work! It will get you revved up in the morning and keep you going all day. You have to try it to experience it! 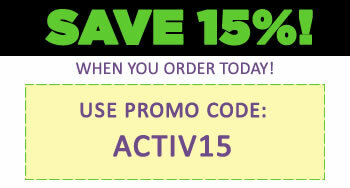 Order now and save on ACTIV for a very limited time! Order in the next 60 seconds to save!